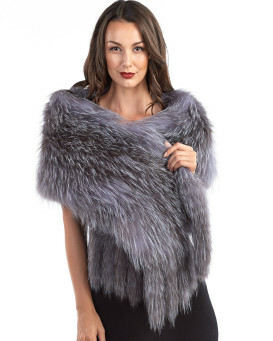 Original design - black leather and real fluffy fox fur is combined to make a piece that's truly special. Alternating wide bands of fox fur and thin strips of black leather create a striped pattern that's beauty comes from it's subtlety. Thick fox fur might cause you to have to take a couple of glances at the piece to notice the leather shining through. This piece can be paired with casual wear for an unforgivable street style. It can also play a role in a luxurious night out, like being worn over a ball gown. 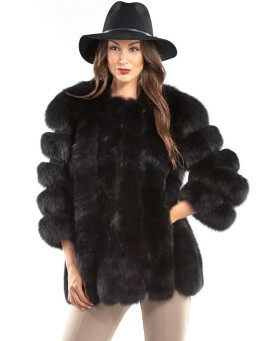 The tiered black fox coat is almost limitless in it's style possibilities. "Was a little unsure about this coat, when I first took it out of the box but, after giving it a good shake and letting it hang for a while, it fluffed up nicely and looks absolutely beautiful. Good fit and feel. Love the design and quality. Smooth sale and service. Well packaged and didn't take too long to ship to the UK. I love that the fur origin is stated on the label and I'm so grateful that the fur came from Finland and not some dodgy fur farm in a country with no rules or standards of treatment of farmed animals. Not my first purchase from this company and certainly won't be my last." "Coat is amazing, More than Amazing! In love with it."